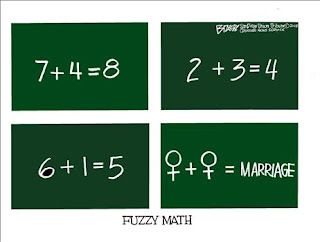 PS 101 Blog: Fuzzy Math? In this cartoon there are four different types of chalk boards. Three of the chalk boards have math equations on them. 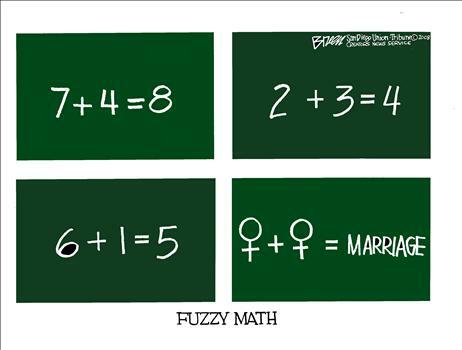 However, each math equation is mathematically incorrect. One the first it states that seven plus four is eight. This is incorrect because seven plus four is eleven. On the second chalk board the equations states two plus three is four. This is incorrect because two plus three is five. On the final chalk board the equation state six plus one is five. This too is incorrect because six plus one is seven. Finally the last chalk board also has an equation. It deals with the issue of gay marriage. It shows that one man plus one man equals marriage. In this cartoon this is meant to be incorrect because it is an antigay cartoon.